Benjamin Paulin is JGPR's Account Manager for Southern New England. Based in our Braintree, Massachusetts office, Ben oversees Rhode Island, Connecticut, and southeastern Massachusetts, including Norfolk, Plymouth, Bristol, Dukes, and Barnstable Counties. MEDFIELD — The Medfield Challenge Success Team is pleased to announce that the results of a student survey were presented to parents by a representative from the non-profit Challenge Success Wednesday night. The survey, conducted by Challenge Success, was given to Medfield High School students in January and was completed by 734 students. Last year, Medfield Public Schools partnered with Challenge Success to find ways that the district could use research-based tools to support student well-being and engagement with learning. Challenge Success is a national, non-profit organization affiliated with the Stanford University Graduate School of Education. Other school districts in the region that have used the Challenge Success program include, Dover-Sherborn, Wellesley, Weston, Westford, Bedford and Concord. Jon Kleiman, Northeast School Program Director for Challenge Success, presented the results of the survey to district administrators and staff earlier this week and to parents at the presentation earlier tonight. Over 180,000 students nationwide have taken the survey that was given to Medfield High School students and the results were measured off of the average results of the past surveys. One of the most encouraging results that the data showed was that 84% of students reported that they have an adult at the school they feel comfortable approaching with a problem. The survey also showed that Medfield High School students spend less time than the average student working on homework each night. On average, Medfield High School students spend about two-and-a-half hours on homework each night, compared to an average of three hours nationwide. The survey identified some areas where improvements could be made both at school and at home. Medfield students were in line with the national average, reporting that they get about 6.7 hours of sleep each night — below the recommended nine hours per night for high school students — and many go to bed around 11 p.m. on weeknights. A lack of sleep can lead to issues like depression, anxiety, short-term and long-term memory issues and could also be a contributing factor in issues like bullying and driving safety. Students were also asked if they had cheated in some fashion over the last month. About 83% of Medfield students who took the survey reported that they had cheated in that time. This places Medfield students in the middle of the pack, where 81-87% of students nationwide admitted to cheating. Parameters that were considered cheating in the survey included working with other students on an assignment that was meant to be done individually, plagiarizing and getting quiz questions or answers from other students ahead of time. Kleiman emphasized to parents that the first year of becoming a Challenge Success school is largely about laying a strong foundation that will be built upon for years to come and that the survey is a part of that process. Medfield Challenge Success is sponsored by the Medfield Coalition for Public Education, Medfield High School PTO and the Blake Middle School PTO. RAYNHAM — Chief James Donovan reports that the Raynham Police Department arrested and charged a man with OUI Liquor following a crash Monday afternoon, April 22. At approximately 4 p.m. Monday, Raynham Police received a report of a head-on crash in the area of 1 East Britannia St. Upon arrival, officers came upon a blue Chrysler Town and Country minivan and a red Honda CRV that had collided and were blocking the roadway. Traffic was diverted while first responders were at the scene. Witnesses told police that the driver of the van, later identified as MARTIN, swerved into the opposite lane of traffic and struck the Honda SUV head-on. Two children, ages seven and five, who were passengers in the van, were injured and taken by a Raynham Fire Department ambulance to Hasbro Children’s Hospital in Providence, Rhode Island. The driver of the Honda, an adult woman, was transported by an ambulance to Morton Hospital in Taunton. The injuries sustained by the children and driver of the Honda are not believed to be life-threatening. During the subsequent investigation and in speaking with MARTIN, officers determined that MARTIN had been driving under the influence of alcohol and placed him under arrest. MARTIN declined medical care at the scene. In searching MARTIN’S vehicle, officers located and seized two empty “nip” bottles of vodka, an ounce of marijuana and a digital scale. MARTIN was taken to the Raynham Police station to be booked. He was expected to be arraigned Tuesday, April 23. WRENTHAM — Town Administrator Kevin Sweet is pleased to announce that runner and vendor sign-ups for the 35th Annual Wrentham Wroad Wrace and Wrentham Day are now open. Wrentham Day will be held from 9 a.m. to 3 p.m.
Wrentham Wroad Wrace begins at 10 a.m. The 5K road race will begin at the Wrentham Town Common and proceed in a loop around the common and the surrounding streets. The race is sanctioned by USA Track & Field and will be timed and scored by Spitler Race Systems. T-shirts will be given out to all participants and beverage stations will be set up along the race route. Following the race, runners will be given refreshments like pizza, bananas, Gatorade and water. The cost to run the race is $25 and sign-up is available online by visiting www.active.com by Sept. 6. To mail your registration, download and print this form and follow the mailing instructions. The registration fee will be $30 on the day of the race. The top three male and female winners will receive a cash prize of $100, $75 and $50, respectively. Runners of all ages are encouraged to participate. 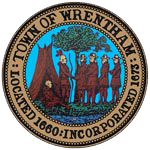 Wrentham Day is sponsored by the Wrentham Recreation Commission and proceeds of the event will go toward funding programming and events put on by the commission. Last year, more than 60 vendors from local businesses, community groups, town departments and youth sports programs set up tables and booths on the Town Common. They sold crafts, food items and clothes and also provided information and ran game booths for those in attendance. The vendor fee is $50. Checks can be made payable to: Wrentham Recreation. Anyone selling food must contact the Wrentham Board of Health at 508-384-5480 to obtain a permit prior to the day of the event. Vendors who require a space larger than 10-feet-by-10-feet will need to request the space and include an additional fee will be assessed. For more information about Wrentham Day or the Wrentham Wroad Wrace, please contact Wrentham Recreation Director Jeff Plympton at [email protected] or by calling 508-384-5427. BEDFORD — Chief Robert Bongiorno reports that the Bedford Police Department is participating in National Prescription Drug Take Back Day this weekend and encourages residents to drop off their unused or expired medications. Additional officers will be at the department on Saturday, April 27, from 10 a.m. to 2 p.m. to assist residents during National Prescription Drug Take Back Day. Saturday’s collection event is part of a semi-annual initiative organized by the Drug Enforcement Administration. Thousands of law enforcement agencies across the country hold prescription “take back” events twice a year in an effort to provide community members with an easy, accessible way to dispose of expired or unwanted prescription drugs. Drug Take Back events also serve as an opportunity for law enforcement agencies to educate the public about the potential for abuse of medications. Studies suggest that the majority of abused prescription drugs are obtained from family and friends, often from the home medicine cabinet. Residents should note that liquids, needles or sharps will not be accepted. Community members who want to dispose of old medications, but are unable to attend the Take Back Day event can call the Bedford Police Department at 781-275-1212 and an officer will come to the house to pick up the prescription drugs. They can also provide residents with a chemical that renders the drugs inactive so they can dispose of them on their own.